Twenty-one years ago, Resources for the Future (RFF), then about ten years old, released a heavy tome of a little over a thousand pages, half text and half statistical appendix, called Resources in America's Future. Together with my two coauthors, Leonard L. Fischman and Joseph L. Fisher, RFF's president at the time, I had put considerable effort into the project. So had fifteen staff members and consultants and eight research assistants. To the best of my knowledge, none of them ever revisited the scene after 1963, and if they did, they didn't tell the world. We hold no reunions, observe no anniversaries. Still I have never quite freed myself of a degree of curiosity, best phrased as "how did we come out?" My own copy of the book bears the scars of that curiosity. It is full of penciled-in figures, put there in different years, without much orderliness. Once in a while, a current event would cause me to do some quick figuring, some comparison shopping. But it has all been quite unsystematic. A number of recent studies have analyzed the role of energy in the structure of production. Most have used either a single time series for a country's manufacturing sector or time series data pooled by country or manufacturing subsector. The absence of similar data sets for developing countries has precluded the same type of analysis of their production structures. This is unfortunate since the impact of higher energy prices on these countries has been at least as severe as on the industrial countries. Furthermore, since it is likely that their structure of production is significantly different, the results of the existing econometric literature may not be applicable in understanding the role of energy prices in their economies. Assessing the impact of electricity shortages is a key problem in determining the optimal reliability of a nation's electrical system. The size of an electrical system's reserve margin will depend to a great extent on how the shortage value is determined. Telson (1975) used macroeconomic data to estimate the upper and lower bounds of the cost for unsupplied electricity. He found the present 1-day-in-10-years loss-of-load probability criterion to be uneconomically excessive and proposed that the criterion be reduced at least to the 5-days-in-10-years level. The economics literature of the oil market is primarily concerned with the behavior of OPEC member countries, viewing the non-OPEC oil exporters as insignificant. Recently, however, oil exports by non-OPEC countries have expanded substantially, increasing the role these countries play in the oil market. Among these countries, Mexico is of special interest because it is the largest non-OPEC oil exporter, with huge petroleum resources; at the same time, it has an enormous requirement for foreign exchange. A variety of public and private incentives are currently used to encourage the adoption of conservation measures and practices. One economic justification for these programs is that the marginal cost of conserving energy through these incentives is lower than the corresponding incremental cost of providing energy through conventional means. Naturally, the marginal cost of conserving energy is critically dependent on the actual, or realized, energy savings associated with the adoption of specific measures and practices. Our contention is that the standard approach to estimating these savings is inadequate. Caves et al. (1983) recently reported that mandatory time-of-use (TOU) pricing for residential customers served by four Illinois electric utilities fails to pass the cost-benefit test. Gains in economic efficiency are outweighed by the relatively high TOU meter costs. An obvious alternative is to offer a TOU rate option for which customer participation is voluntary (see, for example, Woo et al. [1983, Section D] and Malko and Faruqui [1980, pp. 161-62]). The problem of optimal pricing under self-selection has been analyzed by Faulhaber and Panzar (1977), Panzar and Sibley (1978), and Mirman and Sibley (1980). Following these studies, this paper derives the optimal electricity prices when a customer can choose between paying the TOU rates and the full incremental costs of a TOU meter and remaining on a flat rate schedule. My approach departs from the earlier studies in using the expenditure function to characterize the optimization problem as described by Diamond and McFadden (1974). 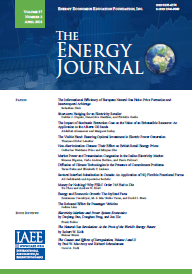 The residential demand for natural gas is the subject of two recent articles in this journal.' Each used pooled time-series/cross-section data to estimate price and income elasticities as well as other relationships that determine the quantity of natural gas consumed by individual households or groups of households. Not surprisingly, among relationships other than price or income, the most important links consumption to weather conditions .2 Regulating natural gas distribution companies requires that this dependence of consumption on weather conditions be recognized and reflected in ratemaking. If it is not (or if it is recognized incorrectly) the regulator will approve prices and revenues that make expected return on utility investment either greater or smaller than allowed return. When input prices are changing rapidly, the delays inherent in rate-of-return regulation can result in rate decisions that are outdated before they can be implemented. Many regulatory commissions have adopted fuel adjustment clauses to remedy this problem. Fuel clauses adjust output price for changes in fuel costs so that the utility's profit remains relatively unaffected. Fuel adjustment clauses are now used in almost all the 50 states and the District of Columbia; a survey by the National Association of Regulatory Utility Commissioners (NARUC) (1978, p. 6) revealed that only 7 states did not permit fuel clauses. The move to deregulate natural gas field markets is likely to stimulate changes in the way the downstream segments of the industry are regulated. In particular, because the uncertainty endemic to freer upstream markets will emerge for the first time in the contemporary gas industry, the relative merits of having pipelines perform different economic functions will be altered. Producers and distributors will also, in varying degrees, face greater price uncertainty than before. This will lead to changes in the desired allocation of risk and incentives associated with activities traditionally carried out by transmission companies.